Takahashi FSQ-106ED @ f/5.0 (530 mm F.L.) Captured at 2.1 arcsec/pixel. Shown at 3.9 and 12.3 arcsec/pixel. SBIG STF-8300M Self Guiding Package w/ mono ST-i, using an AstroDon Ha and Baader LRGB filters. This is a two panel mosaic. Ha 720 min. (48 x 15 min.) "
105 min. (15 x 7 min.) "
133 min. (19 x 7 min.) "
189 min. (27 x 7 min.) "
eXcalibrator v4.30 for (g:r) color balancing, using 238 stars from the SDSS-DR9 database. CCDStack to calibrate all sub exposures, register and stack the color data and create the two RGB panels. PixInsight processing includes registration and stacking the luminance and Ha data, creating the mosaic, gradient repair, non-linear stretching with HistogramTransformation, HDRMultiscaleTransform and LocalHistogramEqualization. PhotoShop for creating the LRGB, adding Ha data to the red channel and final touch up. 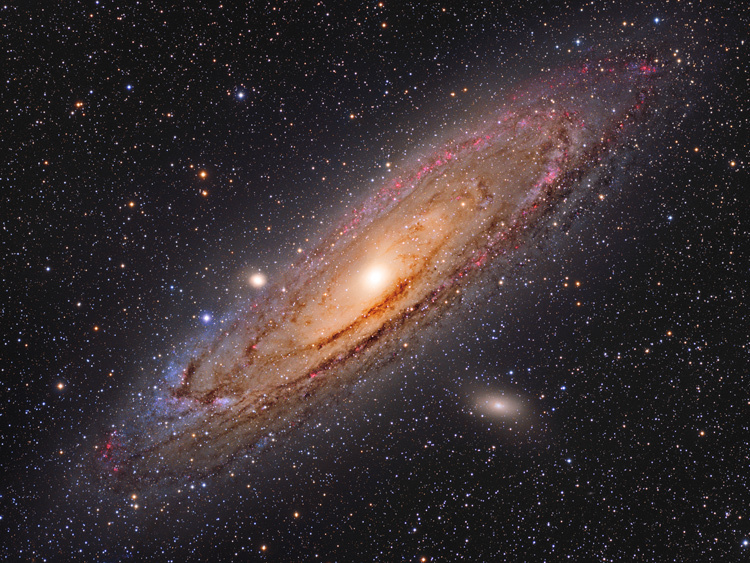 The Andromeda Galaxy, also known as Messier 31, M31, or NGC 224 is a spiral galaxy approximately 2.5 million light-years away in the constellation Andromeda. It is the nearest spiral galaxy to our own Milky Way. M31 is visible as a faint smudge on a moonless night, and is one of the farthest objects visible to the naked eye. M31 can be seen with binoculars in urban areas. Andromeda is also the largest galaxy in our Local Group. To the lower right is the small elliptical satellite galaxy M110. At the left of M31's core is another satellite galaxy, M32. M31 and the Milky Way are orbiting around each other and astronomers are pretty much convinced a collision is inevitable. Current estimates indicate this will occur in about 4 billion years. To call it a collision is somewhat an exaggeration. Very few solid bodies will actually hit each other. Our Sun and solar system are expected to survive the collision and merger.